I was so excited to shoot Mickayle and Aaron’s engagement session! We had bounced around a lot of locations when we finally settled on a local park. The next day I got an email from Mickayle reminding me that we had planned their engagement session on Cinco De Mayo! Knowing the parks would be crowed for the celebrations I quickly looked for a new location. I was in luck and came across a place I had never shot before. I sent my suggestion to the bride to be and she loved it. 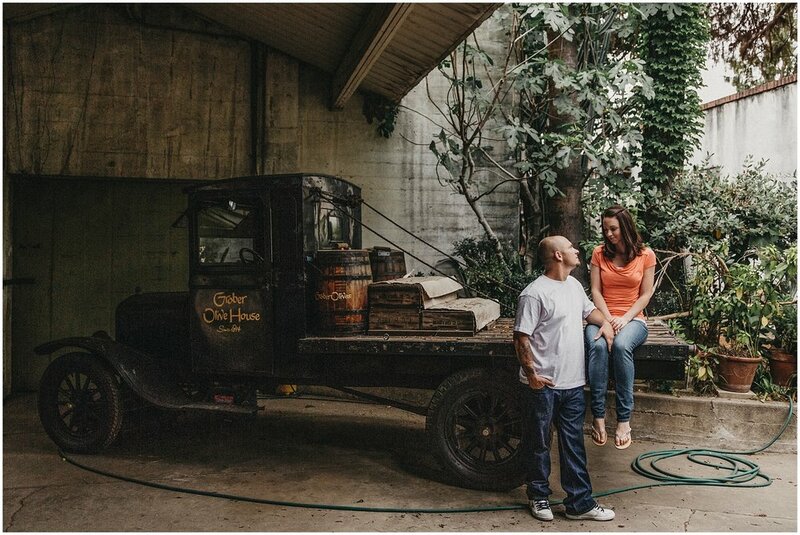 I was so glad she did because the Graber Olive House is BEAUTIFUL! The day of the engagement session was the strangest thing ever. We pulled up to the house to find cops everywhere! They had the block behind the house closed down, apparently they were after some one, so we did the first half of the session with a helicopter flying overhead! We met the owner of the Graber House, Cliff, who was so kind and let us use the grounds and some of the employee only areas. We had a fabulous time wandering around the Olive House together and stopping wherever we found a great spot! We laughed and talked and ended the session in the gift shop. We even learned a little bit about olives! I am thrilled for their wedding in August and enjoyed getting to know them a little more during the engagement session.